Chevy reveals Camaro ZL1 1LE!!! I like when people swap brands without fanfare. I'd have bought the 350R if I could get one 2 years ago. Welcome to a fine group. Have fun with your exclusivity. It should be a head-turner for sure! Baby born 11/08/16. Left birthing place 11/25/16. Arrived home 12/6/16: '17 Red Hot ZL1. Stock. Yes, I am more concerned about the front camber since it's the one that affects the handling/turning more and the required amount of camber or lack thereof. I couldn't even dial in 2.5 neg camber up front as the 19" wheels (stock offset/BS) placed the sidewall right into the strut body. Had to go with -2.0 and take off some material from the strut mount. I hope the DSSV will get us to -3.0 so I'm not ruining A7/R7's. Perhaps I was seeing things. If I had my way, I would prefer that the 6th-gen general forum had 1LE V6 and SS 1LE subforums, and the ZL1 forum would have it's own ZL1 1LE subforum. The only thing the cars all share in common is the badging and the black hood wrap. Other than that, the cars are different enough that you're not really benefiting anything in terms of organization by lumping them together. The fact is that GM sees the 1LE optioned ZL1 as a stand-alone model, as they are limiting the production through constraints. 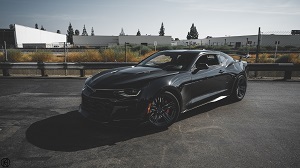 Therefore the ZL1 1LE is the fastest consumer track Camaro ever produced and that it does not have it's own sub-forum is out-of-touch at best. The line should be drawn BEFORE that car. There are some pretty unpopular sub-forums out there that nobody visits. I have to think a ZL1LE sub forum would get a lot of traffic...you know, since ITS THE FASTEST CAMARO EVER. But what do we know? I can't get behind the S550. The GT350 has nothing for me, really. I would end up putting a blower on it, and I'm sort of ending where I am starting here. Plus, the look is...meh. I got offered $5k over sticker for a GT350. Not even an R.
I did what I did with the 5.0 and just got tired of the BS surrounding that racing scene, etc. This is going to be a fun car for me. Definitely a multi-talented piece for sure. This car is a beast, and it looks insane. Just ordered mine last week, can't wait to drive this beast on the track, and around town. I have a 1994 Impala SS (owned 23 years) and purchased a new 2016 Chevy SS last year, which seemed a natural progression. It's an awesome car and very underrated, however it did not quell my midlife crisis. I'm pleased to announce that my crisis has been averted with the order of a Summit White ZL1 1LE. Looking forward to sharing experiences with other owners. Congrats! Ya, much better solution than popping pills eh? LOL! Worth a watch, Lawson calls out that the ZL1 1LE is going to be "Incredible" based on the GT4R. There are some pretty unpopular sub-forums out there that nobody visits. Last edited by PinHead; 06-18-2017 at 09:59 PM.